Yes, there are gods and a dragon in Richard Wagner's "Ring" cycle. But Howard Shore's "Rings" cycle has hobbits, wizards and walking trees. The composer's scores for the film versions of "The Lord of the Rings" are a landmark in film music - deeply textured works that vividly depict J.R.R. Tolkien's fantasy world, and feature chorus and solo singers evoking the many languages of Middle-Earth. Shore won a total of three Oscars and three Grammy Awards for the trilogy. But the score has enjoyed a life beyond the films' recorded soundtrack with special "projection concerts" - screenings of the movie with the music performed live by 300 musicians, bringing the energy of a live performance that can't be experienced in a regular screening. "It's quite different - each evening is new," said conductor Ludwig Wicki, who last fall lead the Lucerne, Switzerland-based 21st Century Orchestra in performances of the first "Rings" film, "The Fellowship of the Ring," at New York's Radio City Music Hall. With each performance, he says, "I discover a lot of new things, and I think, 'Oh, next time I'll do that!" This weekend they are back with the trilogy's second installment, "The Two Towers." Joining the musicians will be the Dessoff Symphonic Choir, the Brooklyn Youth Chorus (a Grammy Award-winning ensemble of New York City elementary and high-school students), and soloists. Video: Children's Chorus Rehearses "Fellowship of the Ring"
When Shore described these concerts as "an enhanced filmgoing experience," it was a supreme understatement. "It's such a unique beast," remarked musicologist Doug Adams of the concert. He said the spontaneity of these concerts goes against the traditional view of films (and film music) as documenting specific moments in a performance. "These concerts break that wall down," Adams said. "It's great to see something created before your eyes, before your ears. I keep joking to people that this is like a live performance of a film - of course that's a huge contradiction in terms, but that's the energy you get out of it." Like a concert work's middle movement, the score for the trilogy's middle film develops in new ways, as new characters are introduced, including the Ents - trees that walk and, when angered, are a formidable fighting force. Existing musical themes are also shifted and melded; for example, distorted versions of the theme associated with the One Ring accompany Gollum, the pitiable creature whose mind has been warped by the ring's power. The lengthy battle scenes are especially striking for their use of music, such as chilling ethereal voices as a villainous army approaches. The live performances make more clear the unusual orchestrations Shore employed to musically illustrate the different cultures of Middle Earth: African log drums, bass marimbas and other wooden instruments associated with the Ents; percussion and metallic sounds, such as chains scraping inside grand pianos, for the marauding Uruk Hai; a "twitchy, trembling" cimbalom for Gollum; and strident strings for the Riders of Rohan. They certainly elevate the music outside the bounds of a recorded soundtrack. "I thought, 'Oh, after 10 performances it'll get routine,'" said Wicki, who has conducted performances of the "Rings" films throughout Europe. "But each passage has many beautiful details, counterpoint, little small things going on. It's so immense." "Shore wasn't simply creating moodscapes," said Adams, a Chicago-based musicologist, who has spent about 10 years producing the just-published book, "The Music of the 'Lord of the Rings' Films'" (Carpentier/Alfred Music). "It's not just a collection of happy sounds and scary sounds and music for love and fighting. There's a real sense of architecture and development." It is also a technical challenge for Wicki, who must keep the music and 300 players and singers in sync with the action. He must keep his eyes on the score, the musicians, and a monitor which displays cues for downbeats, tempo, etc. "An orchestra is human, it's not mechanical," he said. "And they have to follow me. It's really stressful!" The musicians are kept busy - the music runs through almost the entire 3 hour running time. "The longest gap is two minutes," said Wicki. "Often it's 12 seconds, 15 seconds. " Following this week's shows in New York, Wicki will conduct "Two Towers" projection concerts in Grand Rapids, Mich., on Oct. 15-16, leading the Grand Rapids Symphony. 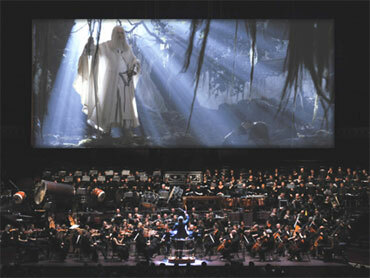 The final "Rings" film, "The Return of the King," will get similar Radio City treatment in 2011. Also next year: More "Rings" projection concerts in New Jersey, St. Louis, and Highland Park, Ill. Though these films were originally released about a decade ago, these projection concerts imply that the films are not simply artifacts of their time. "To hear a symphony orchestra and a massive chorus do these pieces over and over, it makes it more of a living document," Adams said. Wicki, whose orchestra performs many genres of music, says the "Rings" performances have also attracted new audiences to the concert hall. "People said to me last week, 'I was at a Brahms concert' - they'd never gone before. But since they heard us, they say, "Symphony concert, quite cool!'"